The Datsun motor company cemented their rebranding to the Nissan name with the release of the impressive “Hardbody” pickup in 1993. Although it was available in several smaller packages the king cab 4×4 set up presented a formidable competitor in the American market. 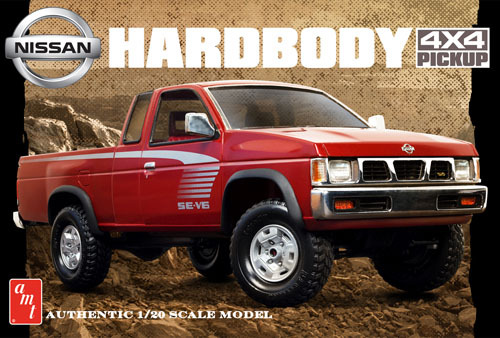 This 1/20 scale model kit from AMT represents a model of the Nissan King Cab 4×4 SE-V6. It features an opening hood to show off the detailed engine. The chassis and interior offer similar authenticity. It includes an optional roll bar and tailgate net. It comes injected in white plastic with chrome and clear parts and vinyl tires. An illustrated assembly guide is included along with a water-slide decal sheet offering multiple graphic options.